In the last exercise the contour lines moved in to the interior of what we were looking at and the drawings developed a sense of the volume as the lines followed different contours. If you make marks along the surfaces you see you can soon create volumes and, with a little dexterity, a variety of textures and a sense of light and dark. 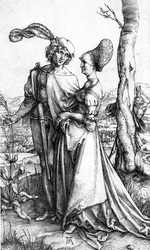 The technique in the Durer print above is known as 'bracelet shading'. It’s as if each volume has a wire bent around it to reveal its three dimensional shape or form. It is a more systematic mark than those you have made by touch but it is very closely related to ‘feeling the form’ . The tree is a particularly good example of this. Overlaps among the volumes are carefully recorded ( especially in the landscape) and we can see how the edges of the figures are these volumes moving away from us (the woman’s back) The volumes recede ( by overlap and the curvature of the ellipse) to give us a sense of depth and space. 2. Arrange some of the objects you have been ‘wrapping’ and using to create volumes through contours and draw them as a group . 3. Imagine your line is being bent around the objects you are looking at. 4.If you see clear divisions of light and dark record this with more dense line work for the contours. You will find this easiest if the light is coming from one direction.